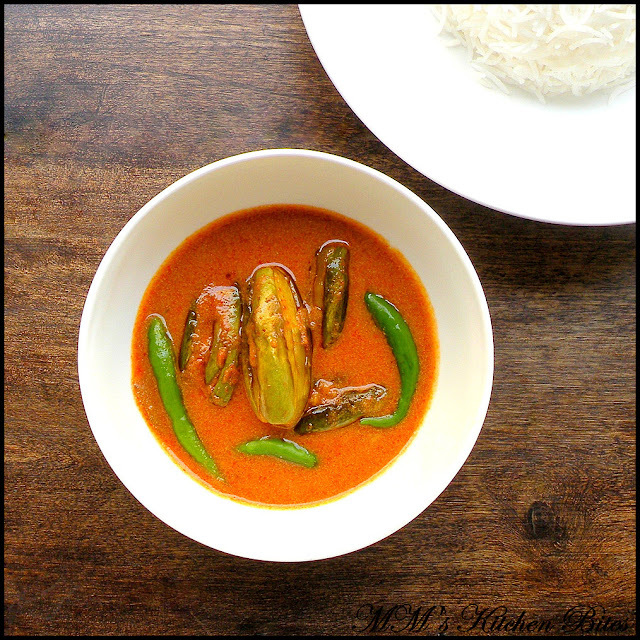 MM's Kitchen Bites: Doi Potol/Dahi Parwal (Pointed Gourd in yogurt gravy )...My Way!! Doi Potol/Dahi Parwal (Pointed Gourd in yogurt gravy )...My Way!! Doi Potol/Dahi Parwal (Pointed Gourd in yogurt gravy)…done my way!! Wash and pat dry the potols. Cut off the ends and peel off the skin in alternate strips. Make an inch long slit on both ends. Chop and grind the onion into a fine paste. Whisk the yogurt well with ginger paste, Kashmiri red chilli powder, turmeric powder, cumin powder, coriander powder, salt and sugar. Keep aside. Heat the oil in a pan and on high heat, fry the potols until lightly browned on all sides. Remove with a slotted spoon and keep aside. In the same pan, add some ghee or oil. When the oil is hot, add cinnamon, green cardamoms, cloves and bayleaf and fry for about 5-10 seconds. Add in the onion paste and let it fry on low heat till all the water has evaporated. Ensure this is done on low heat so that the onion paste gets cooked without turning red/brown. Add in the yogurt mixture and again on low heat fry till all the water has evaporated once again from the mix. Remember – low heat and constantly stirring. Add about a cup of water now and bring to a boil. Add the fried potols. Reduce the heat and let it cook till the veggies are done and the gravy is reduced to desired consistency. Check for seasoning and adjust salt and sugar. Add some green chillies, garam masala powder and switch off the heat. The final taste can be as sweet or as sour you want it be. I typically use about ½ tsp sugar. The amount of sugar you use will also depend on how sour the yogurt is. Do feel free to adjust the amount of onion paste to suit how much and how thick you want the gravy to be. I normally skip adding the coriander and cumin powder. You can add potatoes to this dish, if you want – cut into thick wedges, fry separately till light brown and add back to the gravy along with the potols. Pyaj Aar Posto Diye Aloo Bhaja...long overdue! !